MYRTLE I. ORTWIG, age 89, formerly of Greenwood, passed away at the House of the Dove, in Marshfield, on Wednesday, January 24, 2018. Funeral services will be held at 3pm on Friday, February 2, 2018 at Missionary Baptist Church, in Greenwood. Pastor Geoff Smith will officiate and burial will follow in the Greenwood City Cemetery. Pallbearers will be: William Benzschawel, Nicholas Benzschawel, James Schultz, Andrew Turczyn, Theodore Turczyn and Stephen Stark. Visitation will be held at the church, on Friday, from 1pm until time of service. Myrtle Irene Richardson was born on August 28, 1928 in Zion, IL, the daughter of Harry and Mildred (Brockway) Richardson. She was raised and received her education in Zion and graduated from Zion-Benton High School in 1946. After high school, she worked in the general office of Zion Industries. Myrtle was united in marriage to Samuel B. Ortwig on December 21, 1949 in Zion, IL. They moved to Greenwood in 1959 and farmed until 1979. She also worked at Thorp Finance, in Thorp, for a time. Myrtle spent most all of her life as a homemaker, farmwife, and taking care of children. She was a former member of the Loyal Free Methodist Church, and the Clark County Homemakers. 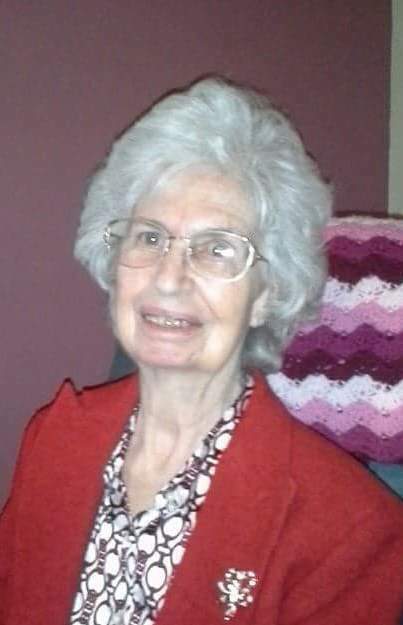 Myrtle had many interests, but especially loved making quilts, but thoroughly enjoyed many other creative endeavors like; knitting, crocheting, sewing, embroidery, reading, baking and gardening. Needless to say, she did not like to be bored or have idle hands. Myrtle was also very interested in healthy living, organic gardening, and vitamins, before they became mainstream. She also enjoyed her years of teaching Sunday School and sharing her love of the Lord. She will be dearly missed by her six children: Jacqueline Nowak of Sussex, WI, Samuel "Bruce" (Karen) Ortwig of Cannon Beach, OR, Kathleen (Stephen) Stark of Appleton, WI, Janette Schultz of Loyal, Daniel (Crystal) Ortwig of Elkton, OR, Rebecca (Andrew) Plaskey of Loyal; ten grandchildren; nine great-grandchildren; numerous step grandchildren and great-grandchildren; one sister: Marjorie Springer of Bradenton, FL, one brother: Glenn (Elsie) Richardson of Beach Park, IL; one sister-in-law: Rachel Richardson of Chippewa Falls; nieces, nephews, other relatives and friends. Myrtle was preceded in death by her parents; her husband, Samuel, on February 6, 2002; one son: David Allen Ortwig; one grandson: Aaron Ortwig; one son-in-law: Dale Schultz; two sisters: Ethel Pushee and Gladys Curran; and two brothers: Ernest and Earl Richardson. In lieu of flowers, Myrtle's family asks that memorials be given to the House of the Dove, or the ALS Society.